I somehow managed to go nearly twenty years without seeing SPACE JAM. But we had a family movie night tonight and my son picked it (with much prodding from my wife). So, now, I have seen SPACE JAM. Go me! I watched SPACE JAM (1996) on 9.20.14. It was my first viewing of the film. All I knew going into this movie is that it was a basketball movie which featured Michael Jordan and a bunch of Looney Tunes characters playing basketball against a bunch of monstrous aliens. Turns out, there isn’t much else to know. This is an amazingly efficient movie. We hear R. Kelly sing I Believe I Can Fly, we meet Michael, we meet bad guy aliens, we meet the Looney Tunes. A challenge is thrown down. Jordan is recruited to the Looney Tunes, they play basketball. We hear R. Kelly sing I Believe I Can Fly one more time. If it all sounds really simple, well it is. 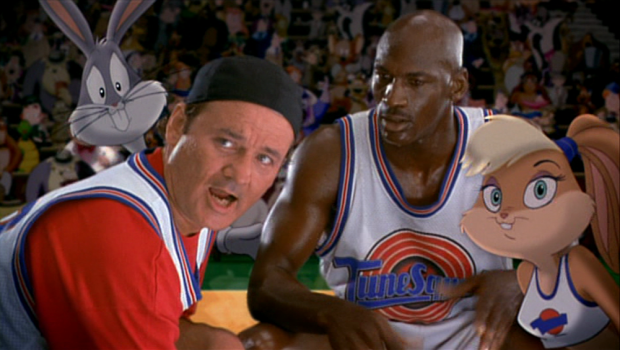 Yet, for some reason, SPACE JAM is also a movie which turns out to be supremely endearing. This is a fun movie from start to end. The humor is surprisingly solid, even if Michael Jordan is never really asked to do any heavy lifting (which is a good thing because his acting skill isn’t top notch). It is interesting how much this film plays with the Jordan basketball/baseball dynamic. Jordan pokes fun at his baseball failures and the script suggests it was a Looney Tunes game of basketball which made him switch back to his primary sport. Conspiracy theorists would argue that he really only paid baseball because he was on super secret probation for gambling. But, hey, I guess an alien basketball game works too. It is also odd to have actors play his wife and kids. I know that shouldn’t be bothersome, but with so many people playing themselves in this movie, it is sort of odd for him to have a fake family. But, officially, I am reading too much into a Looney Tunes movie. This, as I have said, is a fun enough movie which holds up well after two decades. It flies by, and it is one which would not annoy me if my kids decided they needed to watch it a hundred times in two months. ~ by johnlink00 on September 20, 2014.